It's Christmas tomorrow. In a few minutes, really, as it's almost midnight. I should be asleep. I wish I were asleep. I'm sick (I think Santa misread my letter because I know I didn't ask for sinusitis) and the urgent care doctor said I should get plenty of rest. He also said I had tonsilitis, despite the fact that I don't have tonsils, but I've decided to believe that he knows what he's talking about anyway. Hey, maybe my tonsils grew back. Can tonsils grow back? I need to ask Google. But I can't sleep, and not just because my head is a mucus factory (that mental picture is my Christmas gift to you). I keep thinking about Christmas. Not tomorrow, but last year, the year before, the year before that, and twenty-some-odd years of Christmases past. Some families have stars, but we put an angel on top of our tree. My mom bought it from the Avon catalog probably before I was born. It was always the last decoration to go up, and although my dad didn't make a big deal of many things at Christmas, he made a big deal of this. The tree wasn't complete without the angel. If I close my eyes it seems like just a few years ago that I was holding the angel carefully in my little hands while my dad picked me up to reach the top of the tree, telling me, "Hold on tight, okay? Don't drop it." My brother Chris and I would fight over who got to put it on. There were a few years where my dad would lift Chris to put it on, then he'd take it off and give it to me so I could put it on. 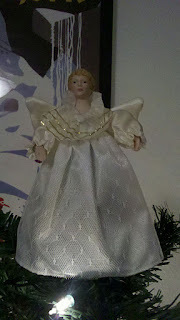 I suspect that in those years, after I'd been put to bed (always first, since I'm the youngest) the angel was removed again so Chris could have the satisfaction of putting the angel on last. That angel is on top of the tree in my living room. Every time I see it, I remember being a kid, excited about little things like that. I remember my dad, who lifted me up to put the angel on for years after Chris lost interest, even when I was probably much too heavy. It wasn't until I turned 10 or 11 and lost interest too that my dad started putting the angel up by himself. I wonder if he ever grieved that - the loss of that simple tradition, the young children we once were. I know that Roo seems taller every time I see her and I think, she's growing up faster than seems fair. I'm sure my parents felt the same way. I'm sure my mother looks at me now sometimes and thinks, how is Jill an adult already? It was just a few years ago she started kindergarten. I think that, too. I didn't think much about my dad being the one to put the angel up until three years ago, the first Christmas after he died. My mom and I put up our little tree - four feet tall, pre-lit - and the last box I opened had the angel in it. There was this moment when I put this last decoration on the tree, and it hit me - the last time I put the angel up, I had help. My father was lifting me up. The last time my hands were on this piece of nostalgia, my father was alive and I was young and I thought he would live forever because he was my daddy. I always miss him more at Christmas, and I don't know why. My father wasn't a big fan of Christmas. I know that his faith in God was strong. But he had little patience for the commercial side of things - for the flash and the expense and the hassle. I think he saw the modern Christmas celebration as something for the wealthy or the unwise with money. He hated that the birth of Jesus Christ was, for most people, a secondary part of Christmas. I know that Christmas was hard when he was a kid. His family never had money. One year finances were so tight that my uncle Danny stole a Christmas tree because they weren't going to have one otherwise. Up until I was probably 8 or 9, we bought a fresh tree every year, and there was always a moment when my dad took his wallet out to pay that he sort of stopped, and I know he was thinking of the year Danny stole a tree. We didn't have any of the kind of traditions that were a given - there were things we'd do for a year or two, or once every few years, depending on circumstances. But there were several years when we'd all sit together and my dad would read Luke 2. He had a very distinct way of reading aloud - sometimes he'd run words together and sometimes he'd pronounce them each more slowly and distinctly - but I found it comforting. I miss the cadence of his voice, his speech patterns. I miss the sound of him speaking, and as the years roll on it gets harder and harder to remember the exact pitch and I think, I heard that voice nearly every single day for 24 years. How can I forget it in only three? But it's slipping away, and I've no choice but to let it. I'll add it to the list of things I don't remember about my dad anymore. I cry every time I add to the list, and I cling more tightly to the things I do remember about him. How has it been three years already? It seems like yesterday. I miss him. I miss him every day, but I miss him especially at Christmas. I think it's because enough of what I still do remember about him has to do with Christmas. Probably because my brain has pushed aside memories of school and friends and Girl Scouts and piano lessons and made room only for memories that it thinks are important and valuable, like Christmas. There are very few Christmas decorations and songs and other things that don't remind me of my dad in some way. I hear "White Christmas" on the radio and I can remember my dad singing along with it, doing his best Bing Crosby impression. There are ornaments from my childhood that I broke more than once and each time it was my father who patiently repaired them with Super Glue. My mom bakes homemade cinnamon rolls every December and when I eat one I think, Dad loved these. Even the act of fluffing my artificial tree's branches reminds me of him, because he was allergic to pine trees and the year we bought a fake tree was probably the happiest Christmas he'd had in ages. When we opened presents on Christmas morning, it was always my dad who got the camera and took pictures. He never told us to say cheese. He'd just say to my brothers, "Hey, boys," and when they looked up, he took their picture. He was funny that way. We never believed in Santa - my parents didn't feel comfortable lying to us - so I knew, the year I pulled the funnies off a brand-new dollhouse, that it was my dad who had stayed up late putting everything together. He installed batteries, he assembled bikes and inflated their tires, he put stickers on little toys and games. As soon as a toy was unwrapped, my dad would make sure it was ready to be played with. He was always putting things together, fixing things, finding things, improving things. It wasn't until he was gone that I really appreciated how many things he did, how his mind was always working, how he was always figuring out how things worked and what he could do with them. But he was most of all a good father, the very best in the world. I always knew that he loved me. He told me so every night before I went to bed, so that when I fell asleep his words were still in my ears. On Christmas, at bedtime, he told me he loved me, and he always said, "Merry Christmas, Jilly Bee" and smiled at me, that smile that I can see traces of in my own face sometimes in the mirror if I turn my head just so and crinkle my eyes like he did. He's been gone for three years, and I still don't know what I'm going to do without him. I don't know if any of you know this about me, but sometimes I like to talk about grief. And by "sometimes" I mean "at least once a week for the past three or four years." It's kind of become my thing. I guess that's okay. I gave a presentation at the national FSA conference on grief and healing (as they pertain to birth mothers). I think it went okay. And then, because it was easier than coming up with something new, I gave that same presentation at the regional conference last month. I've had several (and by "several" I mean, "as many as two") people ask me for an outline of my presentation. And since I have been too busy/lazy to blog lately, I thought I would finally give in and post it on my blog. In an effort to stretch out my laziness, I'm going to split it into more than one post. Also, it's kind of long, and I think my eyes would glaze over if I had to sit and read the whole thing, and I wrote it. So I'm assuming that no one else wants to sit here for thirty minutes squinting at a computer screen. Even though some of you probably do that anyway, playing Farmville or watching cat videos on YouTube (my favorite is this one) or whatever it is that people do on-line for the 4-6 hours a day that Google says we're spending. Wow. Isn't it a shame when bad things happen to good sentences? Let's move on. So, here it is. My thoughts on grief and healing, as I wrote and presented them (with a few clarifications and additions), minus the insightful comments that other people made during my presentations. Sorry about that. I should have taken notes. You may feel at times like, “Grief: you're doing it wrong.” But the odds are, you're doing it right, because what's wrong for someone else may be right for you. How many of you have ever felt like you were grieving placement improperly: too long, too short, too much, not enough? No two birth moms are going to grieve exactly the same, and that's okay. The intensity and duration of your grief aren't as important as what you get out of it – its productivity. Grief can and should be productive. As long as it's moving you forward in some way, you're doing it right. You won't find yourself moving forward very much at first. Grief is more of a reflex. It's up to you to make it work for you. And it is work! It's neither easy nor fun, but the only way out, as they say, is through. You can push it back, stuff it down, box it up all you want, but eventually it's going to have to be dealt with. I recommend starting now! It won't get any easier. But it's important. How many of you have felt like you shouldn't be grieving at all? When I think of the kind of life I want to live, I think of my Savior. He set a perfect example for us. Do you all remember that short scripture that's so easy to quote? “Jesus wept.” If He wept, I think it's okay for us to weep, too. Emotions - the full gamut of them - are a gift from God. Embrace them. Give yourself permission to grieve. It is a perfectly healthy response to any kind of loss. I had a birth mom tell me once that she felt selfish for being sad, because she knew adoption was right for her baby. If any of you share that belief, I want to disabuse you of it. Your grief is NOT selfish. You grieve because you love, and it is the most selfless love in the world. The world won't always understand this. For example: when my father died, my mom was treated with sympathy, kindness, patience, and understanding. No one accused her of being selfish for her sadness. On the other hand, after I placed, people told me I was being self-centered, that I needed to stop thinking about my own pain and do something for someone else, that I needed to snap out of it and move on already. It goes without saying that that kind of attitude isn't very helpful or respectful. If you've been on the receiving end of that kind of “advice,” please disregard it. You need to grieve just as much as someone who has lost a spouse. Placement is a death, in a way. Your baby is gone – he or she no longer exists. In their place is someone else's baby. And you're not just grieving one single moment of loss but a lifetime of things that won't be as the child grows up - or, rather, things that will be, but without you. It's like that for anyone who's been through something big. There might be a day or a month for cancer or adoption or civil rights or anything else. But whereas most people think about it for a day or a month, if it's personal for you, every single day is, for instance, National Adoption Day. It's not a once-a-year occasion. I don't specifically think of adoption every single day, but I do think of Roo and, as I placed her, adoption is in there somewhere. I can't separate Roo from adoption. Without adoption, I wouldn't be blogging right now. I'd be chasing a two-year-old around, trying to keep her from breaking the ornaments on my Christmas tree. Or not. It's the weekend, so I might not have custody of Roo today; H would. I know that having to share custody would have broken my heart. I try to remember that kind of thing whenever I get these rosy ideas about what being Roo's mother would be like. I wouldn't even get to be her mother full-time - and not just because of H. I would probably be at work today, because if I'd chosen to parent Roo, I'd be working at least two jobs to try to keep afloat. I'd have to. I mean, I'm falling under as it is with the one job I'm working now, and I only have to take care of me. I can't imagine trying to take care of someone else. It's just ... I love her. I think I'm always going to imagine what one thing or another would be like, even though I know my imagination glosses over the reality of what it would be like. I can't help but think about her, and I can't help but miss her. It's not always a terribly sad thing. And over time, it's become something that isn't always Roo-specific. I miss having a baby and I miss being a mother in general. I've been told by more than one birth mother that I'm lucky because I "got to" parent Roo for a couple of months before I placed her, that they're jealous. I hate hearing that. I feel like it diminishes the difficulty of placement - like it was a breeze because I got to spend time with Roo first, or like I was always going to place her but I parented first just to see what it was like. Whenever I hear placement stories, birth moms say things about how they cherished their time in the hospital because they knew it was their only time with the baby they were going to place. They often say that they wished they had more time. Sometimes I selfishly wish I'd had less. Not that I would ever, for anything in the world, take back a single second I spent with my baby when she was mine. But the fact that I hadn't previously made an adoption plan, that I planned to be and was in fact Roo's mother, that made it so much harder for me to place her. [I want to specify here that I'm not saying that it was any harder for me to place than it was for anyone else, but that parenting first made adoption harder for me personally.] I knew exactly what it was that I was going to miss. I had been not just a mother but Roo's mother. If I hadn't been above 100% certain about P and M, I never could have placed. But as I said, I have moments these days where it's not baby Roo that I miss entirely; it's motherhood. I have always wanted to be a mother. I worry sometimes that Roo was my only shot at motherhood. Sometimes I feel okay with that. Sometimes I think, "Roo is enough. The time I had as her mother was enough. If that's all I ever get, I'm okay with that." Other times all I can think is how grossly unfair life is. The key is balancing those times, making sure the former is more common than the latter. I'm not quite there yet.